The Osborn Experience redefines casino entertainment. More than a man and a microphone. More than cheap laughs and old routines. A stunning light and sound spectacle guaranteed to keep your guests laughing and your showroom full. Read on to find out how. Whether you're looking to fill your main showroom, offer entertainment for VIP or Players' Club events, or even offer seminars or wellness programs to your guests and employees, we've got you covered! The Osborn Experience is a great choice for your main showroom! 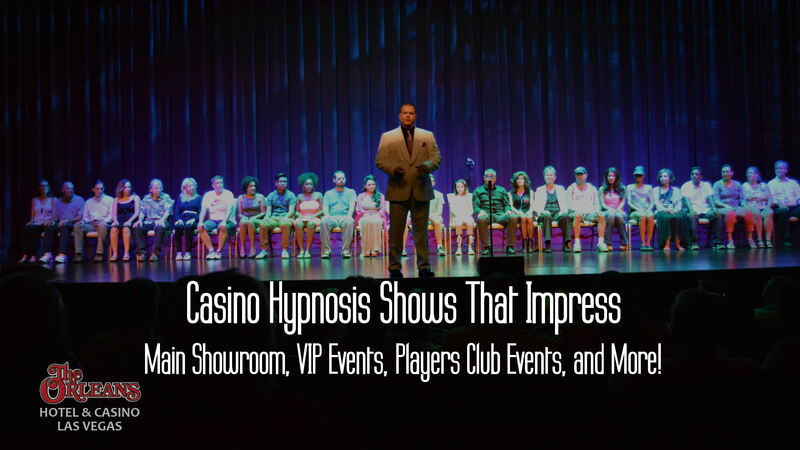 Comedy hypnosis shows are a classic casino showroom draw. 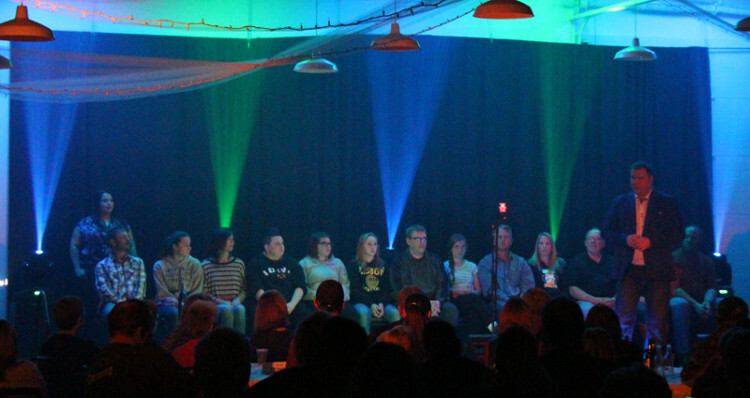 We can provide everything from sound to lighting to stage assistants to ensure you have a smooth, easy experience. Your casino VIPs and Players' Club members expect certain perks. Why not host a private hypnosis show, just for them? Make them feel special. We can even incorporate themes from your players club or VIP marketing to give the show an extra punch! Offer a stress relief, smoking cessation, or weight loss seminar at your casino! Perfect for VIPs and Players' Club events as an added perk, or for your employees as part of a wellness program at your casino! Crowds in the showroom mean crowds in the casino. Comedy hypnosis shows are classic casino entertainment! Guests flock to showrooms to see their friends do hilarious and crazy things on stage! The Osborn Experience is great main showroom entertainment that your casino guests will request again and again. We want to be easy to work with, so we employ a full-time production engineer to work with your production team ahead of time to make sure our show goes off smoothly. Maybe you want to sit back and let us produce the show. We can also provide a complete A to Z production in your showroom! We have a complete professional-grade sound system that can fill most any showroom, conference center, or performance venue (indoor or outdoor!) and a stunning theater quality light rig to really wow your guests. We'll even provide our own professional stage assistants! Imagine having a production like this one show up at your door and fill your showroom! In addition to all that, we have more than enough material in our repertoire to do multiple shows without repeating! You can book us for multiple engagements and not have to worry about your guests seeing the same show over and over! 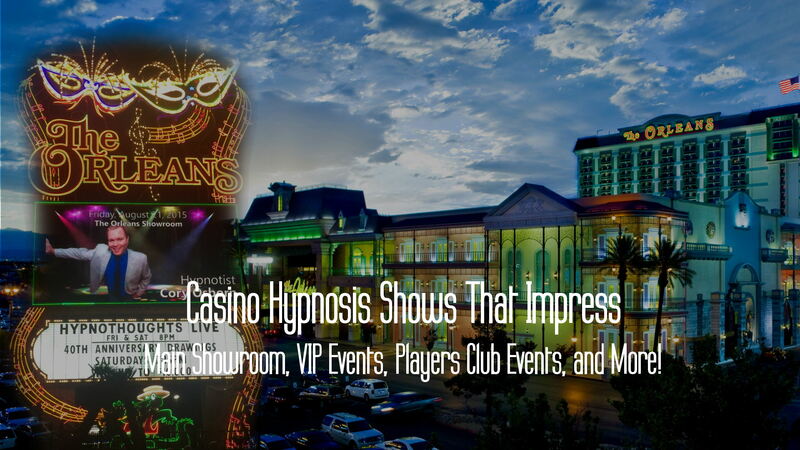 We can do a standard hypnosis show, or spice it up a little and perform our Vegas-style show...or both! Book us for one show, or multiple engagements! Get all this - a professional production team, a professional-grade sound system, a theater-quality lighting spectacle, multiple show possibilities - and do it for a fraction of the cost it would take to bring in a national touring band or comedy act. Your VIP gamblers and Players Club members deserve something special for being regular patrons. Why not give them a private hypnosis show all of their own? The Osborn Experience is perfect for these events! Hypnotist Cory Osborn has entertained crowds large and small all across the country. You can integrate our show into one of your existing events, or host a special show just for your most dedicated customers. We can perform in nearly any venue where you choose to hold your events - a meeting room, ballroom, bar, restaurant, or showroom. Our show scales up as you add more attendees, so we're able to perform for pretty much any group in any space. And while you're looking for unique opportunities for VIPs and Players Club members, why not offer them additional benefits like smoking cessation, weight management, or stress relief seminars? Our seminar series can be presented as a stand-alone program or as part of a larger event. Our seminar series is a unique way to add value and loyalty to your programs!